The western half of the association is mainly ditch and shelter belt riding and the eastern half follows the Red River and the woods from Park River to Hoople. This trail association provides many places to stay for travelers on a snowmobile trip. 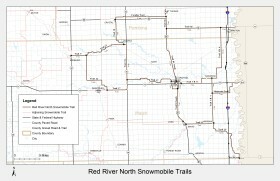 The Red River North Trail system has a lot to offer snowmobilers who are looking for fun and relaxing snowmobile trips with the variety of riding and many miles of trail.